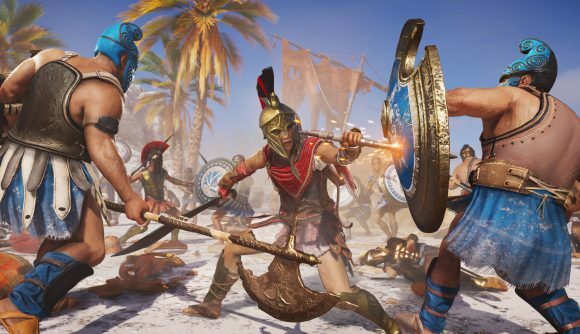 With its move to Ancient Greece, Assassin’s Creed Odyssey is making some key changes to the dynamic combat system the series established with Origins last year, giving players more options in building their characters. In a new gameplay video, Ubisoft focuses in on Odyssey’s combat system. As in Origins, fights are lively and full of movement, based around light and heavy attacks, parries, and abilities. Unlike Origins, though, Odyssey’s Spartan mercenaries don’t use shields. Phillips says Odyssey’s combat removes the “turtling with a shield” style that was a reliable tactic in Origins, pushing players to dodge and parry instead while remaining on the offensive. Certainly, it’s thematically consistent with the ferocity of Spartan warriors of myth. Odyssey keeps Origins’ adrenaline system, the meter you build during normal combat in order to unleash devastating finishers. But this time, the finishing moves are based around the Spear of Leonidas, and you’ll be able to use Odyssey’s RPG-inspired skill system to unlock, upgrade, and select various abilities with the spear. You’ll also be able to unlock abilities for your regular melee and ranged weapons, and in the video you can see one that fires an area-of-effect volley of several dozen arrows down on a target, striking three enemy warriors at once. In all, Phillips says there are “30 plus” abilities to unlock and upgrade. These abilities are mapped to four keys, or the face buttons on the controller, and you can swap them out and rearrange them as you see fit in the skills menu. All in all, it looks like a much more customizable version of the Origins combat system. Assassin’s Creed Odyssey is due out on PC and consoles October 5.